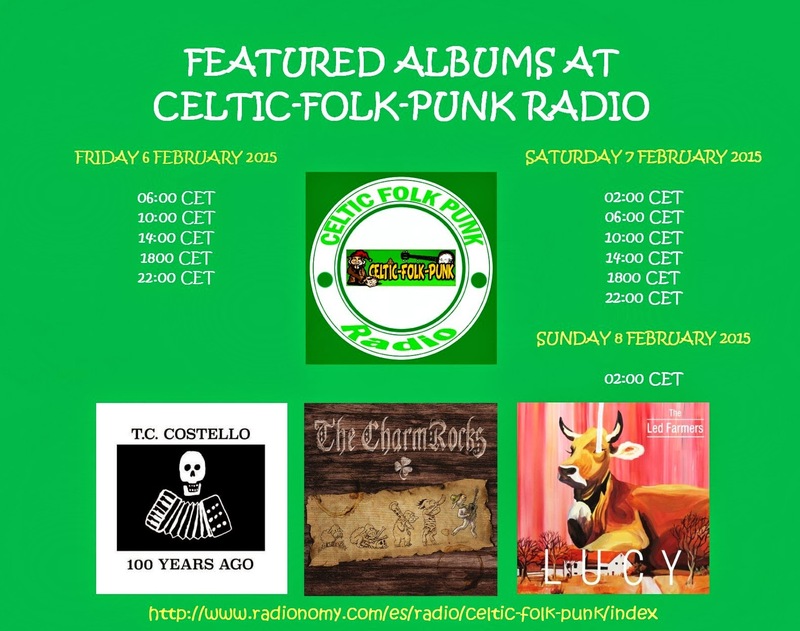 T. C. Costello "100 Years Ago", The Charmrocks "s/t" and The Led Farmers "Lucy" are the featured CDs at Celtic Folk Punk Radio. 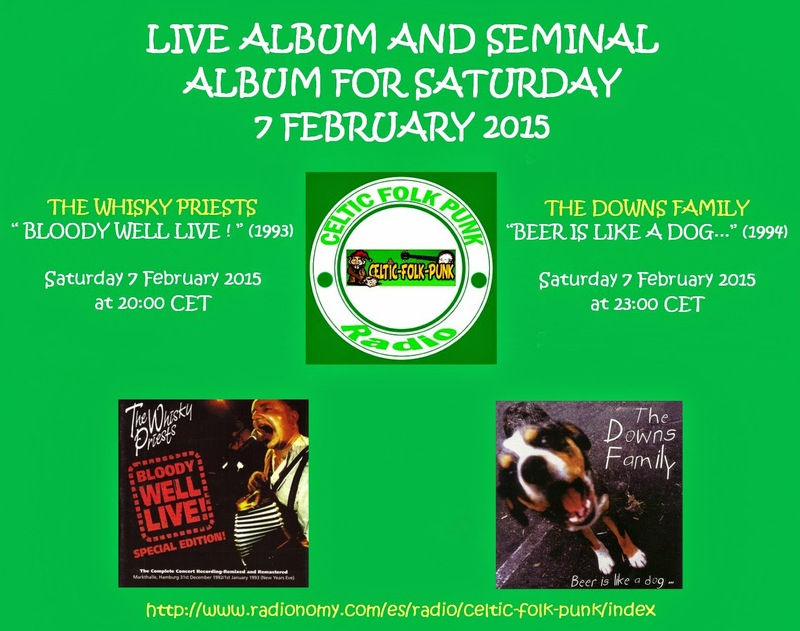 Songs from other bands will be played too (Mick O'Toole, Scordisci, Deiedra). There are two different playlists, and therefore every 4 hours the songs won't be the same. Moreover, the order will be different every day. That is, if you can only listen to the radio on Friday, for instance, at 22h00, you can listen again on Saturday at 22h00, since the songs won't be exactly the same. 1993 was only one-hour-old when the lights went down and The Whisky Priests took to the stage. In front of a capacity crowd of 1500 singers, dancers and drinkers, the band launched into a blistering two-hour set of unreserved power, passion and energy. The concert typified the enthusiasm of both band and audience throughout the tour. The highlights of the gig, presented here, stay as true as possible to the running order on the night. Gary features on the majority of lead vocals, with Mick taking over on ‘Bonnie Gateshead Lass’, the haunting introduction to ‘The Raven’, and the classic crowd favourite ‘Dol-li-a’, which includes the whole of the Markthalle crowd helping out on backing vocals. Glenn belts out the passionate poem ‘The Lads of Wear and Tyne’, during the middle section of ‘Farewell Johnny Miner’, and the band throws in a number of instrumentals for good measure. Containing material from throughout their whole career to date, plus three previously unavailable tracks, ‘Bloody Well Live!’ showcases the diversity of The Whisky Priests in a live gig setting. Listen to the ease with which they alternate the mood and tempo of their performance, Listen also for various background noises, including the sound of the smoke machine cutting across the music, or various members of the crowd attempting to recreate the sound of ‘goblin laughter’, during the introduction to ‘Goblins’, before Glenn and Paul take over. An equipment malfunction, resulting in loss of material on the night, had led to our second live release ‘“Here Come the Ranting Lads” - Live!’ in 1999, being issued as a single CD, instead of the planned double CD, which was to have featured the entire show. Following this disappointment, we cast our minds back to our first live release, ‘Bloody Well Live!’, which had been successfully recorded in its entirety on New Years Eve 1992/3 to a 1500 strong sell-out crowd at the Markthalle, Hamburg. Suddenly, the germ of a plan to re-assess the ‘Bloody Well Live!’ recordings was born. As the original 17-track single CD version of ‘Bloody Well Live!’ had been deleted for a number of years, and there was still a big demand for this landmark release, now seemed the perfect opportunity to go back to the original master tapes and restore this recording to its full glory. Following a four-year apprenticeship performing throughout the UK’s underground rock venues, The Whisky Priests had ventured to the European mainland for the first time in 1989, with a highly successful 7-date tour of Germany. Further tours to Germany and the rest of Europe quickly ensued. By the end of 1992 The Whisky Priests had graduated into a well-oiled (in more ways than one!) live machine. This recording perfectly captures the live essence of the band during that period, and in fact the original Bloody Well Live! proved to be a landmark for The Whisky Priests on its release in 1993. The Bloody Well Live! Tour, running from the end of March to the middle of June 1993 was a whirlwind experience, with 72 concerts in 12 weeks throughout Europe. The Bloody Well Live! Again! Tour followed later in the year, consolidating both the album’s and the band’s general success at the time. Now, in our 15th Anniversary year, this unedited Special Collector’s Edition of ‘Bloody Well Live!’ presents for the first time ever the entire concert recording, remixed and remastered from the original master tapes, and including previously unissued tracks as well as all the re-inserted between song dialogue, warts and all. Isn’t it grand boys, to be even more Bloody Well Live!